Founded in 1933, South China Normal University (SCNU) is a key university with a long history of cultivating talents, a comprehensive range of disciplines and rapid development momentum. Recent years have witnessed its becoming a member of “Project 211”, the co-construction of SCNU by Guangdong Provincial Government and Ministry of Education, its entry into Guangdong High-Level University Sponsoring Project and its entering the national project of "World-class Disciplines Construction". The discipline of Physics of SCNU has entered the national project of "World-class Disciplines Construction". Its discipline of Psychology ranks among the top three in the national universities. In the fourth round of discipline evaluation organized by the Ministry of Education of China, four disciplines of SCNU, Psychology, Education, Physical Education and Marxist Theory, have been ranked as A-level disciplines. The number of its disciplines rated as A+-level ranks second in Guangdong universities and third among China's normal universities. Five disciplines, Chemistry, Plant & Animal Science, Engineering, Mathematics and Materials Science have entered top 1% of World ESI, ranking third in the number of so-honored disciplines among national normal universities. SCNU also boasts four state-level key disciplines (Educational Technology, Developmental and Educational Psychology, Optics and Sports Humanities and Sociology), nine key disciplines of "Project 211" and twenty-three key disciplines of Guangdong Province. SCNU prides itself on three campuses: Shipai Campus, Guangzhou HEMC Campus and Nanhai Campus, with a total school area of over two hundred hectares, a total building area of 1.55 million square meters, and a total collection of 3.74 million books. 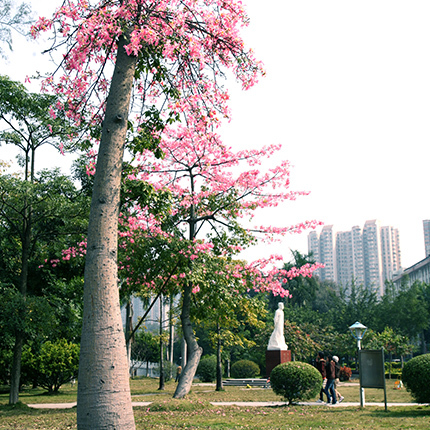 The scenery of the campus is pleasant with beautiful cultural landscape and strong cultural atmosphere. South China Normal University is currently recruiting high-level or young talents in China and from abroad. Welcome to join us! Mathematics (Basic Mathematics，Computational Mathematics，Applied Mathematics，Financial Mathematics、Mathematics Education), Statistics, Physics (Particle Physics and Nuclear Physics ,Theoretical Physics, Condensed Matter Physics, Atomic and Molecular Physics, Optics, Acoustics, Radio Physics, Semiconductor Physics), Chemistry (Macromolecular Chemistry and Physics, inorganic chemistry, analytical chemistry, organic chemistry, physical chemistry）, Biology (Botany, Zoology, Biochemistry and Molecular Biology, Cell Biology, Neurobiology, Biophysics, Fisheries Science, Genetics, Crop Science, Crop Genetics, Crop Breeding Science, Bioinformatics, Biomedical Engineering, Immunology), Ecology (Phytoecology，Zooecology，Environmental Ecology, Microbial Ecology, Molecular Ecology), Environmental Science and Engineering, Geography (Physical Geography，Human Geography，Cartography and Geographic Information System), Geology, Marine Science, Optical Engineering，Materials Science and Engineering（Materials Physics and Chemistry，Materials Science，Functional Oxide Materials，Optofluidics Materials and Devices，Polymer Optoelectronic Materials and Devices，Multiferroic Materials and Devices，Semiconductor Optoelectronic Materials and Devices，Nano Materials and Devices）, Electronic Information（Circuits and Systems，Microelectronics and Solid Electronics，Electromagnetic Field and Microwave Technology，Physical Electronics，Electronic Engineering，Information Engineering，New Display Technology，Machine Vision or 3D Display，New Information Storage Materials and Devices）, Communication Engineering, Hydraulic Engineering（Hydrology and Water Resources），Surveying and Mapping, Medical Sciences（Clinical Medicine: Phymatology, Clinical Laboratory Diagnostics, Foundation Medicine: Pathogeny Biology, Immunology), Computer Science (Computer Software and Theory, Data Science and Big Data Technology, Intelligent Science and Artificial Intelligence, Network and Information Security, Cloud Computing Services and Internet Applications etc. ), Software Engineering，Social Networks and Media Mining，Educational Information，Psychology and Brain Science（Brain and Cognition, Brain Diseases, Psychological Statistics and Measurements, Psychological Counselling and Treatment, Human Resource Management and EAP, Human Factors Engineering and User Experience）. Philosophy，Economics, Management，Finance（Financial Engineering）, Law, Politics, Sociology, Marxist Theory, Education (Early Childhood Education, Special Education, Comparative Education, Pedagogy, Curriculum and Instruction, History of Education, Higher Education, Adult Education, Vocational and Technological Education, Educational Leadership, Elementary and Middle Schooling）, Educational technology, Physical Education and Sports Science, World History (Ancient History of the World, Medieval History of the World, Modern History of the World, Contemporary History of the World), Chinese History (Ancient Chinese History, Modern and Contemporary Chinese History), Archaeology and Museology, Chinese Language and Literature，Foreign Language and Literature (English Language and Literature，Foreign Linguistics and Applied Linguistics，Translation，Comparative Literature and Cross-cultural Studies)，Journalism and Communication，Public Administration，Art (Music and Dance，Radio and Television Programming，Fine Arts，Design). Requirements: Candidates, preferably under 55 years old, should have great academic reputation and leadership. He/She is expected to have achieved internationally recognized landmark research achievements and have had abundant research achievements in recent 5 years. Candidates can assume the leading role in the field of his/her research and can be qualified to be listed in national top talents or scientific research programs such as Changjiang Scholars Program, China National Fund for Distinguished Young Scholars. Rewards: Candidates can be recruited as professor. SCNU will provide competitive annual salary and housing allowance. Research start-up fund will be provided according to actual needs. SCNU will also help build the research team. His or her children can apply to study in the affiliated kindergarten and primary school of SCNU according to relevant regulations. Both the kindergarten and the primary school are among the best in China. Requirements: Candidates, preferably under 50 years old, are expected to have great academic leadership and have achieved nationally recognized landmark achievement and have abundant research achievements in recent 5 years. Candidates can assume the leading role in his/her discipline or field of research. Requirements: Candidates, preferably under 40 years old, are expected to have gained his/her doctoral degree in well-known universities, have achieved original scientific research results and have great potential for development. Rewards: Candidates can be recruited as professor, associate professor or position of equivalent level. The candidate will be rewarded with an annual pre-tax salary of 300,000-600,000 RMB. Housing Allowance of up to 2 million RMB will be provided. Research start-up fund will be provided without a cap according to research fields and actual needs. His or her children can apply to study in the affiliated kindergarten and primary school of SCNU according to relevant regulations. Both the kindergarten and the primary school are among the best in China. First-category Young Talent: Candidates, preferably under 38, are expected to have gained his/her doctorate degree from or have done postdoctoral research in such universities or institutions as Chinese Academy of Sciences, Chinese Academy of Social Sciences, domestic universities ranked no lower than SCNU in comprehensive competitiveness or in relevant fields or the top 300 universities in the world (internationally recognized four global university rankings: ARWU, QS, THE, US News, the same hereinafter). Domestic candidates are expected to have done postdoctoral work and have presided over provincial and ministerial research projects or research projects of equivalent value. Second-category Young Talent: Candidates, preferably under 35, are expected to have gained his/her doctorate degree in recent three years from such universities or institutions as Chinese Academy of Sciences, Chinese Academy of Social Sciences, domestic universities ranked no lower than SCNU in comprehensive competitiveness or in relevant fields or the top 500 universities in the world. Rewards：First-category talent will be recruited as Special Senior Research Fellow and second-category talent as Special Associate Research Fellow. For first-category talent, the starting salary is 250,000RMB and for second-category talent 200,000 RMB. During the tenure, the annual salary will be raised and the difference in salary will be compensated from the date of employment if relying on resources of SCNU, the candidate, as the project leader, can successfully apply for the following scientific research projects: for a project supported by National Foundation for Young Scholars, the salary will be raised to 300,000 RMB, and for a project supported by National Foundation for General Programs, the salary will be raised to 350,000 RMB. Research start-up fund of up to 200,000 RMB will be provided to the candidates recruited for the first time in the fields of science and engineering and research start-up fund of up to 100,000 RMB for candidates from other disciplines. Monthly rental allowance of 3000 RMB will be provided during the tenure. His or her children can apply to study in the affiliated kindergarten and primary school of SCNU according to relevant regulations. Both the kindergarten and the primary school are among the best in China. First-category Postdoctor: Candidates, preferably under 35, are expected to have gained his/her doctorate degree in recent 3 years or have passed oral defense of dissertation in current school year in such universities or institutions as Chinese Academy of Sciences, Chinese Academy of Social Sciences, domestic universities ranked no lower than SCNU in comprehensive competitiveness or in relevant fields or the top 500 universities in the world. Second-category Postdoctor: Candidates, preferably under 35, are expected to have gained his/her doctorate degree in recent 3 years or have passed oral defense of dissertation in current school year. Rewards：First-category postdoctor will be recuited as Special Associate Research Fellow and second-category postdoctor as Special Assistant Research Fellow. For first-category postdoctor, the annual starting salary is 220,000RMB and for second-category postdoctor 200,000 RMB (postdoctoral fund of 150,000 RMB supported by the state or Guangdong province included). During the tenure, the annual salary will be raised and the difference in salary will be compensated from the date of employment if relying on resources of SCNU, the candidate, as the project leader, can successfully apply for the following scientific research projects: for a project supported by National Science Foundation for Postdoctoral Research, the salary will be raised to 250,000 RMB, for a project supported by National Foundation for Young Scholars, the salary will be raised to 300,000 RMB, for a project supported by National Foundation for General Programs, the salary will be raised to 350,000 RMB. Postdoctoral apartments can be rented according to the regulations. If the postdoctoral apartments can not be arranged or the candidate can resolve his/her own housing issue, the university will provide the candidate with a monthly rental allowance of 3,000 RMB. His or her children can apply to study in the affiliated kindergarten and primary school of SCNU according to relevant regulations. Both the kindergarten and the primary school are among the best in China. One copy of CV, including a list of research projects, publications (please specify collection by SCI, EI, SSCI, CSSCI as well as journal impact factor and citation frequency) and award-winning achievements in the last 5 years.